Please share the “Radhanath Swami” you know–with the world! Mail anecdotes of Radhanath Swami at stories@itsohappened.com and attach the corresponding images, if any. Note: Your writing may be slightly edited for the better understanding of our readers. I met Radhanath Swami first time in 1998 at Mumbai Airport. We had come from Pune and had gone to the airport to receive him. I was at the back of crowd of students and wanted to give him rose. I had not personally seen him before, so I didn’t know what to expect. As he came out of the airport, I offered him a rose, which he graciously accepted and with a big grateful smile, told me “Thankyou Very much”. The second time that I met him was in the temple 2 days later. He was on giving a spiritual discourse and more than his discourse, I appreciated his humility and behavior. Through my first experience, I already had understood that this person is very popular. During his discourse, I sat there patiently trying to hear. I couldn’t stay longer as I had very little understanding of philosophy. So I went out and stood in the Verandah of Chowpatty temple. After the class he came out and we (students) greeted him, he embraced me and went out. I was surprised at his humility. No stranger before had done that to me. It was a fatherly embrace. He is roughly my father’s age. My father had died when I was 6. So I accepted him as my father. it was just few days since i had come to the temple. and the only friend i had in the whole temple was Radhanath Swami. Yes believe me, everyday from college i would come to temple and tell him all about what was happening with the Students agitation that i was involved with against the dean of my colege who was victimizing the students. There was another Brajwasi girl who had come from some village in barsana, who was staying at the time at the temple. She was a young girl, typical village type, did not know english and simple. somehow she became my friend. one day she told me to go to meet maharaj, as she was getting severe pain in her leg. so we met and she told maharaj in her broken english that she was having a lot of pain in her foot. maharaj looked at me….and then asked me to massage her feet. he then put forward his leg and showed me exactly how i should massage her feet. he told me to start immediately. so we went back to the room and i started massaging her legs. after about 10 mins i saw maharaj standing at the door and checking to see if i really was massaging her feet. he looked straight at me and smiled in a very pleased way which i did not understand that time. But after many years i realised that i was tested by him. he wanted to see whether i was proud that i was a student in a medical college , and if i could take the humble position of massaging someone’s feet. Also he wanted me to engage me in the service of a Brajwasi for my purification. All Glories to HH Radhanath Swami (http://www.facebook.com/pages/Radhanath-Swami/51051167747). My first encounter with him was in the Sri Sri Radha Gopinath Temple, when my counselor HG Gaur Gopal Prabhu was trying to cultivate KC in my stoned heart. After coming in contact with his The Journey Home book, i realized the essence of being a Krishna Conscious person. I feel myself more blissful than before, with many questions getting answered. All Glories to Guru Maharaj, HH Radhanath Swami. I love the depth he takes us to when during Kirtans. It can be clearly seen from the deep emotions he has, because of tremendous taste he has for the Holy Name, love of Krishna. Just by a minute of his association, we can get drops of nectar of love of Godhead. This happened in 2005 Festival of Inspiration @ New Vrindaban. All god-brothers and god-sisters were sitting in Room no. 9 (Guru Maharaj’s reserved room). Maharaj was asking everyone how they are doing, etc. Maharaj knew that I had recently come to USA and was looking for a project to start working. Maharaj thought for few seconds and looked at me with a joking smile and said: “It’s like being married; without a wife.” Everyone sitting in the room burst out in laughter including Maharaj in his legendary complete body shake laugh. Then Maharaj looked at Raasanath prabhu and said: “It’s like being a brahmachary without an ashram.” Everyone was just laughing like anything. Then Maharaj went on to give a wonderful powerful short talk on ‘Complexities in Kali-yuga’. He described how mankind makes things complex instead of keeping things simple. He narrated the story of ‘The Frankenstine’ to illustrate this. All Glories to HH Radhanath Swami Maharaj! I first came to know of Maharaj at New Vrindavan. I started reading the Journey Home and came to the Preface section. It felt like some detective story. Each and every line got me into such a curiosity that I held my breadth and read it. Then I understood, that things like this would also happen in real life. Jai Radhanath Swami. Mahaprabhu’s childhood pastime of getting colied by ‘Ananthasesha’ as a baby . Another incident of HH Radhanath Swami Maharaj swimming in the Ganges and almost getting sucked into the quick sand of the Ganges recalls to my mind Chaitanya Mahaprabhu almost getting drowned in blue waters in search of Krishna. HH Radhanath Swami Maharaj’s adventures in his spiritual quest showed his complete faith and surrender to the Lord. So much simplicity and sacrifice that it brought tears into my eyes as I moved from page to page. His preference for ‘braj roti’with ‘gur’ over other exotic dishes even while traveling in an aeroplane taught me to appreciate simple things in life. His life in his book “The ourney Home” made me realize that one can be renounced without attachment or pride. That is possible when one is truly a cent percent surrendered devotee of the Lord. I am deeply inspired by the transcendental qualities of my Guru Maharaj HH Radhanath Swami, who according to me is a living, talking representative of Sri Chaitanya Mahaprabhu. 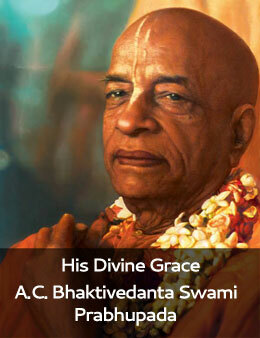 He has rendered yeoman service in trying to give ‘Krishna-prema’ to millions of people around the world. Yesterday i happen to meet one person jagannath who is brajwasi (which i came to know later) when i was going to home from temple,initially from material point of view i understand he was financially very very poor (because of his dirty clothes and appearance) i ignored him (please forgive me) but as i interacted with him more i understood why brajwasis are great devotee of lord he told me that how Radhanath maharaj was to pat him on his back,personally gave him mahaprasad manytimes and how maharaj offers respects to Brajwasis. radhanath maharaj loves all brajvasis and offer all respects from heart to them.he doesn’t discriminate person and all brajwasi are his family members. i still remember my 1st interaction with maharaj on oct 5th 2003 after sunday feast in Radha Gopinath temple, when one of the senior devotee suddenly pulled me and said lets meet maharaj. i was shocked and totally out of sorts as i was very fearful of meeting him as i knew he is going catch me red handed for all the anarthas that i ve. still i thought it is worth a purification. i sat in front of maharaj there were 2 other devotees too. the senior devotee introduced me to maharaj and after gave me a scanning look i was spell bound, i could feel thru his penetrating and unblinking glance he was finding may be identity details. i was sure that i going to get some serious whacking thru his words or expressions but on the contrary he took near him and very lovingly placed my head on his lap and caressed it for few minutes. i was wonderstruck and deeply impressed by his level of compassion and his radiating smile which gave me the necessary impetus.Although i m still struggling in spiritual life but whenever i think of that incident it helps me considerably in my spiritual life. My best time with Maharaj personally is when I met him in Mayapur. We were taking his darshan while he was speaking to some senior devotees. After he ended his conversation with those devotees, he walked towards his room and we were on the road to him room. He walked then suddenly returned we were standing just besides one shop and we thought he is coming to a shop to meet the owner because the owner was also a devotee. However to our surprise he came and embraced me and then he embraced my friend Santosh who was standing behind me. It was ecstatic experience. I feel that and pray to Lord Radha Gopinath that I may be able to reciprocate with Guru Maharaj’s this act by truly embracing his teachings to my heart and follow them as long as I live. “I must meet him”, my mind screamed within. It was the year 2007, I was visiting holy dham of Mayapur for the first time during Kartik. As I was relatively new in ISKCON, my past conditioning had led to cause inconvenience to my Spiritual Master, Radhanath Swami Maharaj. As I sat in his lecture, somehow I kept wishing I could apologize at least once to him personally. Then after some time, Radhanath Maharaj came to me. “I am sorry Maharaj, ………..” I stammered. “You are forgiven.” He said. These words will remain with me throughout my life. Wish I had confessed all my sins at that time, because I know if not anyone in the world, Radhanath Swami Maharaj would forgive me. I wanted to ask Radhanath Swami a question about my career. I was doing a residency in Surgery in New York. My schedule was very hectic and was struggling to chant 16 rounds. I wanted to ask him whether i should continue in Surgery or switch to another specialty which is less hectic. Maharaj was visiting Bhakti center (NYC ISKCON temple) and i approached him one morning when he was walking in the temple, chanting and occasionally talking to some devotees. He even spoke to my wife. Then i went up to him and asked, “Maharaj, can i ask you a question?” He smiled very lovingly and replied, “I’m chanting my rounds.” Then He walked away. I felt sad that He did not speak to me. But later i realized what Maharaj wanted to teach me–> 1. should not disturb him when He is chanting 2. should give proirity to my chanting and all questions will be answered automatically. I quit Surgery and took up a less hectic specialty. I am happy now and feel grateful to Maharaj for his guidance. Thank You fro Sharing ! Hare Krsna ! Thanks for sharing these unforgettable divine experiences with Radhanath Swami! Yesterday, HH RNS taught me a good lesson. I was told by Anang Mohan prabhu(A senior and quite known figure in ISKCON Kolkata) to take Maharaj to toilet. It was a new place for Maharaj. Soon Acharyaratna Prabhu(Temple Vice President and Maharaj’s dear disciple) joined Maharaj as I was escorting him to toilet. He just didn’t acknowledge me and was talking with Acharyaratna Prabhu. When Maharaj entered toilet Acharyratna Prabhu excused himself for other responsibilities.Coming out of toilet, Maharaj didn’t see any known face He turned to me(an insignificant and unknown face) to say something but words were just short of his lips and he turned away and kept mum. I was little bewildered if I had offended him in any way. It forced me to churn my heart and I reflected: Since I was not introduced as sincere servant by any devotee dear to him, he didn’t accept my service. Similarly, If a dear devotee of Krsna doesn’t introduce an insignificant soul to Krsna, Krsna doesn’t personally accept his service directly. So, we should better try to be servant of servant; not servant directly.